Grease a 13x9 pan with cooking spray. 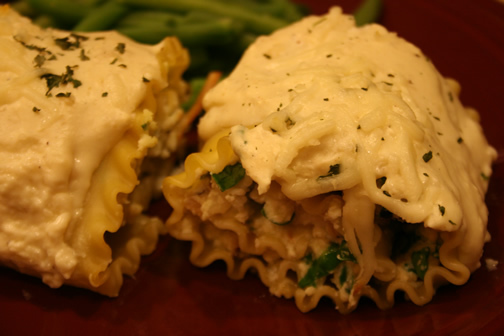 In a medium sized bowl, combine the chicken, spinach, ricotta and parm cheese. Spread the mixture down the center of each noodle, leaving about an inch and a half at each end. Roll the each noodle and place it in the pan. For the sauce, melt Cream Cheese, Butter, and Milk together in a saucepan. Add remaining ingredients, Garlic Powder last. Stir with a whisk until all melted together. Pour the sauce over each noodle. Top with the 4 oz. of shredded mozzarella cheese. Menu Plan Monday - Blogiversary Giveaway! White Christmas Flirty Apron Swap Done!